We’ve lived on the North Shore for over 15 years. In all that time, my wife and I have never made it to the top of Dog Mountain. Once, when we had our kids with us, we made it about a third of the way, but had to give up when a fog bank settled in making it hard for us to see the ground. It didn’t help that our kids were not thrilled about climbing up the mountain in the first place. I think the only reason they didn’t raise up a fuss is because they were hoping to see some dogs. Nate figured they wouldn’t have called it Dog Mountain for nothing. That was more than ten years ago. This time our kids chose not to join us--surprise, surprise—some things never change. We had a perfect day for it: not too hot and not too cold. Dog Mountain is located on the west side of Mount Seymour. You can park your car in the parking lot at the top of Mount Seymour and go from there. The hike takes about one-and-a-half to two hours round trip, depending on how much time you spend at the top taking in the incredible view. You can literally see all of Burnaby and Vancouver from the top of Dog Mountain. We got to the top right around lunchtime. Quite a number of people were eating food. It wasn’t long before a huge black raven appeared out of nowhere. 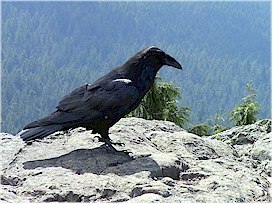 We had never seen a raven up close before. I was surprised at how large its’ beak was. Mary and I had to laugh because it seemed quite at-home, even in charge, as it hopped mere feet away from us, looking for leftovers. It had no problem staring us right in the face; in its’ own way demanding food. The hike itself is quite picturesque as well. Several people stopped at the pond with lily pads to take pictures. I would say the hike is of medium difficulty. Mary was having a hard time keeping up with me. Her excuse was the nobbly roots jutting out of the ground were making it difficult for her to walk. Whatever you say Dear. I had one event that took me by surprise. Usually I’m pretty good with directions, but I got completely turned around on Dog Mountain. Somehow we took a wrong turn on the way down and I started going back up the mountain. Mary kept saying, “There’s something wrong; I saw those people on the mountain top and we left before they did. Finally, a couple who recognized us from the top asked us if we knew we were going back up the mountain. At that point I had to admit I was wrong and Mary was right—I guess there’s a first time for everything. We plan on going back up Dog Mountain in the winter, when there’s a blanket of snow on the ground. I’d like to try snowshoeing to the top. Hopefully the raven will be there to greet us. 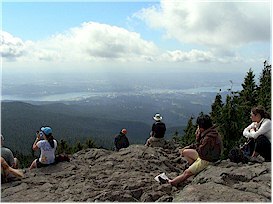 Dog Mountain is a short hike from the top parking lot on Mount Seymour. To get to Mount Seymour you need to get to Mt. Seymour Parkway Road, which is the third exit off the Second Narrows Bridge (going north). You’ll see a big fat Canadian Superstore on your right. Pass that and stay on the Parkway for about 4 km. You’ll eventually get to a shopping plaza called Parkgate. Turn left at the first set of lights at the Parkgate Plaza. Then just stay on Mt. Seymour Road for about 7 miles and it will lead you up to the ski complex. From the north end of the parking lot, walk north about 75 feet and you will see on your left, signs for First Lake and Dog Mountain.